Louisiana is disappearing under water – can oyersts save it? And although the precise magnitude of their effect is still being debated, they are a natural barrier against storm surge, hurricanes and flooding. The wetlands at Biloxi Marsh – a web of bayous, brackish and salt lakes in south-east Louisiana that give way to Eloi Bay, Chandeleur Sound and, finally, to the Gulf of Mexico – help protect even New Orleans, 45 miles away. The landscape here always has been changeable. But such enormity of land loss is new. Most of it is due to the Mississippi River levee. Since the levee’s construction in the 1930s, the state has lost one-quarter of its wetlands: just under 2,000 square miles (5,100sqkm). That’s the size of Delaware, or Trinidad and Tobago. If nothing changes, Louisiana will lose another 1,000 square miles (2,600sqkm) – that’s a Rhode Island or Luxembourg of land mass – by 2050. Finished in November 2016, the reef – the first built by the CRCL and The Nature Conservancy in Louisiana – was a massive project. The 1.7 million pounds (771,000kg) of shell used were contributed by 26 local restaurants, including a dozen in New Orleans. This isn’t the world’s only oyster shell recycling programme; there are similar projects in Texas, New York, San Francisco and the Chesapeake Bay, as well as in Australia. But given the number of oysters that are shucked around the world, these programmes are relatively few. She rattles off the reasons why. By being in the water the shells are, obviously, not in a landfill. The nooks and crannies of oyster shells provide extra surface area, absorbing wave energy and buffering the coastline more than a flat structure. They also offer protection to smaller sea creatures. And the shells allow water, bacteria and algae to flow through them – crucial for the marshes, which use the tidal flow to ‘breathe’. One benefit of having live oysters is that the reefs then grow vertically – and can do so faster than sea level is expected to rise. Another benefit is water filtration. Each tiny creature can clean an impressive 50 gallons a day, making them the ocean’s most effective water filters. They also capture and store nitrogen and phosphorus. This means that as the land naturally subsides, as the soft sediment of an estuary does, it is no longer replenished – the main reason for that Delaware-sized disappearance into the Gulf. And the irony is that, although the levee was built to protect communities and industry from the mighty Mississippi, now it is having the opposite effect. The more marsh is lost, the less protection Louisiana’s residents have against floods, storms and sea level rise. For the two-thirds of residents who live near the coast, this can be particularly deadly. The data has borne this out. One study determined that a hectare of oyster reef was worth up to $99,000 (£77,000) per year in terms of benefits like the habitat it provided for other fish and its effect on water quality – not including the value of those oysters being harvested. In terms of flood and storm protection alone, an oyster reef provides more value for money than even levees or dykes. 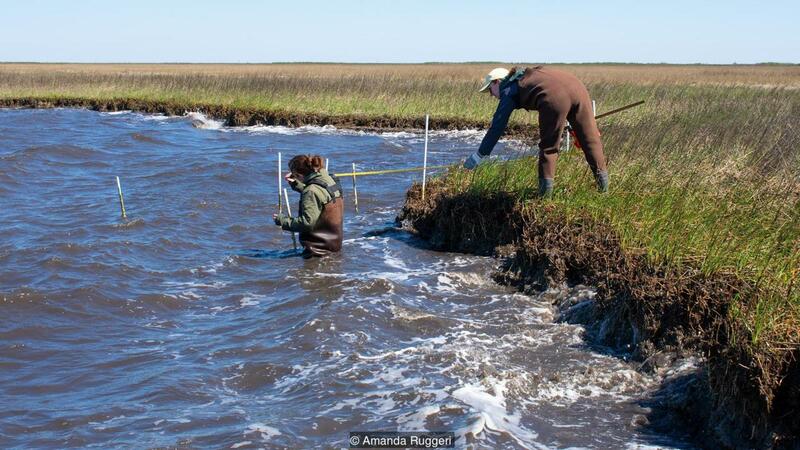 In April 2018, a team of scientists published a cost-benefit analysis of projects being done across the Gulf, from building dykes to restoring barrier islands. Costs of construction and maintenance were weighed against the effectiveness of flood and storm protection – calculated using economic models developed by reinsurance company Swiss Re with its partners. (Read more about how the financial industry is developing tools to calculate the risk of climate change and what that could mean for climate resilience projects). The findings were stark. Anything with a benefit-to-cost ratio above one is, of course, seen as cost-effective. In terms of reducing risk alone, dykes and levees had a benefit-to-cost ratio of 0.26; beach replenishment in the western Gulf, 0.28. Restoring oyster reefs (7.34) was calculated to be 28 times more beneficial. And restoring wetlands? Thirty-three times more (8.72). The only project with a higher benefit-to-cost ratio was sandbags – but only because of how cheap they were. In terms of overall risk reduction, the benefit was low. Then there is the value of the fishing industry in general. Oyster reefs like this one aren’t built to be harvested, of course. But by bolstering the ecosystem, they help. Across the US, about 75% of marketable fish and bivalves rely on salt marshes to survive. In Louisiana, they’re the foundation of the most productive commercial fishing industry of the lower 48 states. Louisiana lands 1.2 billion pounds (544m kg) of fish annually. The next state, Washington, lands 552 million (250m kg). Louisiana’s oysters alone make up one-third of the US oyster industry, crabs one-quarter. It lands more shrimp than Texas, Alabama and Florida put together. If the wetlands were to continue to disappear, if the Gulf were to become a mud- and toxin-logged swamp, it’s reasonable to think that that industry would vanish, too. That would wipe out more than 160,000 fishing jobs alone – never mind the knock-on effect to the food, restaurant and tourism industries. We want to put dollar signs on all of it. That’s particularly true before deciding if something is worth saving. And particularly now, with not only industry statistics but with newly sophisticated models for measuring the financial risk of events like coastal erosion and flooding, we can. But that’s only part of the story. The other part is what surrounds us as we head back towards the mainland: egrets fluttering, fish swirling, alligators stalking, grasses waving – and perhaps little oysters moving below us with the tide, searching for a new reef to settle on and thrive.